*This post is sponsored by Scholastic. I was compensated for my participation. All opinions are my own. As a parent and former educator, I know just how important reading is. Helping our children develop a life-long love of literacy is perhaps one of the most important things we as parents can do! While summertime is known for outdoor adventures, fun in the water, and family vacations, it can also be a time of the dreaded “summer slide.” Without daily practice, children can regress in their skills and abilities over the summer. Encouraging our children to read over the summer is a simple yet incredibly important way to prevent our children from falling behind. Scholastic is helping parents and families this summer, with their exciting new summer reading program! Kids can log their reading minutes (online and on smartphones) as they Read for the World Record, enter sweepstakes to win fabulous prizes, and earn digital rewards when they complete weekly reading challenges. 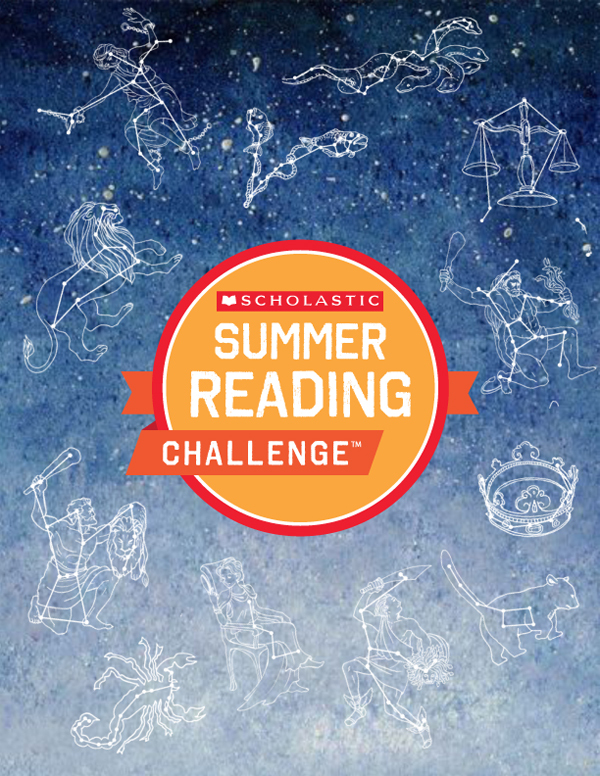 This year’s Summer Reading Challenge theme is “Reading Under the Stars” (powered by Eveready®). Throughout the summer, kids will read around the galaxy and unlock star constellations as they log reading minutes. I absolutely LOVE this year’s theme. Everybody knows kids love to be outside in the summertime. And, unlike during the school year, parents are a bit more likely to let kids stay up to see the stars come out. It gives me goosebumps to imagine a world where our children are excited to stay up late to READ! Some of my favorite childhood memories involve a flashlight under the covers – and the compulsive need to read just one more chapter! Kids will be learning as they log minutes as well. Unlocking various star constellations has led to some great discussions around our house – not to mention some star-gazing! Additionally, children can complete challenges each week, which focus on reading comprehension. Children are asked to read a short and informative selection, and then answer questions based on the passage. It’s great practice for a skill that is easy to miss during other summer learning activities. Reading + Learning + Fun + Great Incentives = A Can’t Miss Opportunity for Kids & Parents!! Sign up today! Every Monday, check Scholastic on Twitter for the #MondayMinutes. See the total number of minutes kids have read to date! Every Friday, follow the Scholastic Facebook calendar for Friday Freebies! Every Friday, check out the Summer Reading Challenge Pinterest Board for a new collage of summer books. The Scholastic Reading Timer app encourages reading every day and most importantly, makes it fun! The app allows users to time reading minutes with an interactive stopwatch and track minutes on a weekly log. Plus, parents can check children’s reading activity in addition to browsing daily tips, articles and book lists. Scholastic has compiled a list of tips to get kids to read this summer. You can check out that infographic below. I also wrote a post for Scholastic Parents about ways to increase summer reading. You can read that article HERE. If you’re looking for a book suggestion, check out my list of 100 MUST-READ Chapter Books, or my list of 100 Favorite Picture Books. Happy reading!